One of sportsLevi’s Stadium Art Painting artist John Robertson’s San Francisco 49ers football art at the new SF 49ers Levi’s stadium. 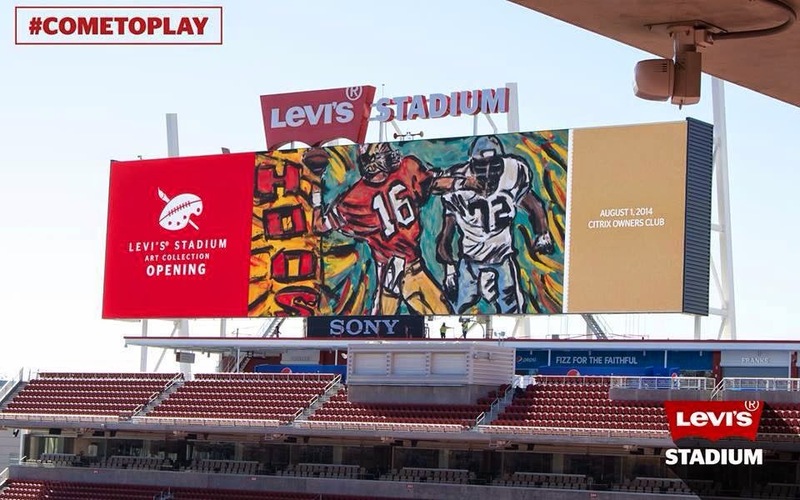 It was fun to see his work on the 48 foot by 200 foot LED video display screen at Levi's Stadium art collection where he has a number of sports art paintings. Sports Artist John Robertson completed the group of football paintings for the 49er’s a couple of years ago. As you can see in the photo that the painting was projected up onto the Levi’s stadium jumbotron screen overlooking the playing field. The painting is of the 49er’squarterback Joe Montana throwing a pass in the famous “The Catch” play where the defensemen lineman Too Tall Jones, from the Dallas Cowboys is rushing him and eventually knocks Montana to the ground. Joe Montana did get the pass off and the football play depicted in the painting is completed to wide receiver Dwight Clark. "The Art Collection at Levi’s® Stadium celebrates the 49ers legendary history, the organization’s current success and the vibrant culture of the greater San Francisco Bay Area. No other multi-use stadium contains the quantity and scope of original artwork that this collection has procured. The galleries highlight diverse, local artists and include pieces that have personal ties to the 49ers organization. The 49ers are thrilled to present a collection that enhances the building by creating a fully integrated visual experience. Guests will encounter larger than life portraits of 49ers greats, alongside charcoal sketches that celebrate notable regional figures such as Steinbeck and Kerourac (actually created by John Robertson’s artist wife, Lynn Hanson) Visitors may marvel over pieces from the Ranchos of the Santa Clara Valley and the timeless psychedelics of the storied FillmoreMusic Hall. The collection has been crafted to engage and provoke everyone from the casual fan to the art aficionado." "The Art Collection at Levi’s® Stadium is home to over 200 original pieces and more than 500 photographs. The museum-quality artwork featured is comprised of mixed mediums such as acrylic, charcoal, enamel, oil, pastel, pen and ink, stencil, metals and sculptures. Of the 23 original artists showcased, 20 hail locally from California. The photographs in the collection are from the archives of the 49ers and their esteemed group of team photographers, as well as from the San Francisco Chronicle and many local libraries and historic centers..